Such a simple idea has helped us, and over 100 other teams, use both Slack and Basecamp to their full potential. We’ve been Basecamp users for years. It’s an outstanding tool that lets our team work together and stay organized. When you combine it with email and Campfire, you’ve got everything you need to run a business. But, the system falls apart when you switch from email and Campfire to Slack for team communication. As soon as we moved to Slack our Basecamp email notifications sat neglected and unread in our inboxes. We’d respond to the notifications eventually, but always a few days or even weeks later. Not the responsiveness you need when you’re bootstrapping a small business! 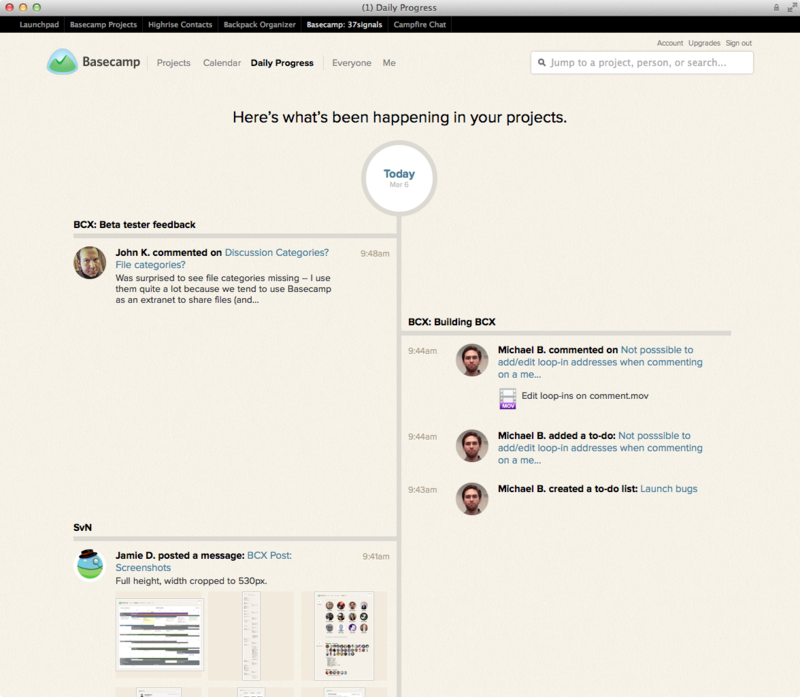 We didn’t want to abandon Basecamp, because it was the perfect tool for our team. But we needed a way to keep on top of all the work happening without relying on email notifications. We wanted our Basecamp activity in Slack. 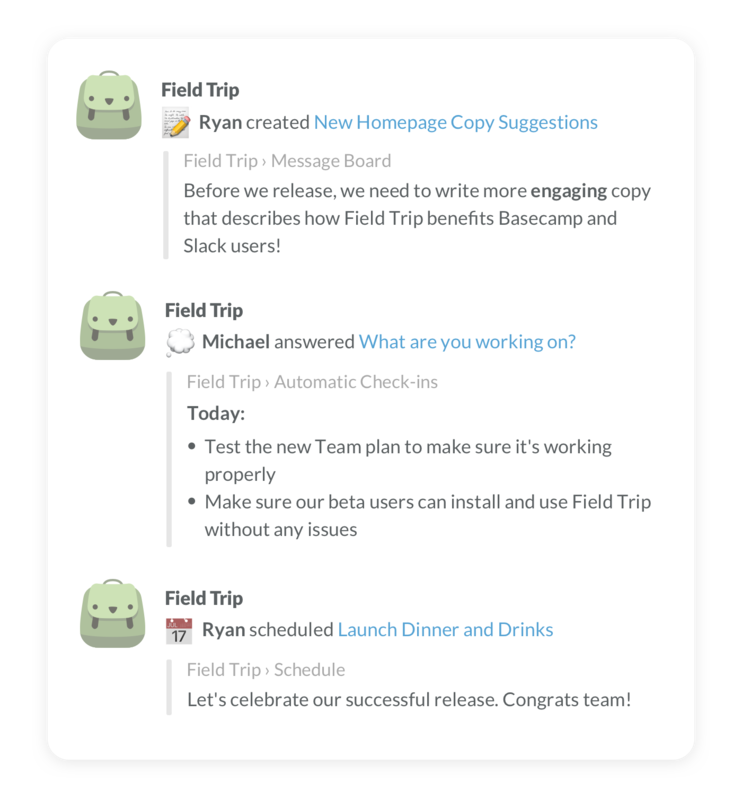 Field Trip takes your team activity from Basecamp and shares it in Slack. We kept it simple, all you need to do is choose a Basecamp project and Slack channel. Then any activity Basecamp adds to your timeline is sent to the Slack channel that you picked. That’s it. Keep working the same way you already do and your entire team will be able to stay on top of work as it happens. Zapier — After setting up some multi-trigger zaps, Zapier lets you send a lot of your Basecamp activity to Slack. Unfortunately, it’s in raw, unformatted HTML. Creating multi-trigger zaps may be easy for some of you, but it’s not easy for the rest of us. Plus, setting up all those zaps is pricey. Slack Email Forwarding — You can forward your Basecamp notification emails directly to Slack. The messages come from Slackbot and look a bit wonky, but it’s free, easy to set up, and gets some Basecamp activity in Slack. Open Source — We found two projects on GitHub that share your Basecamp activity in Slack. Unfortunately, both are inactive, require paid hosting, maintenance effort, and don’t have the quality you’d want in a system that helps your team be productive. Just incase it wasn’t clear, none of these options solved our problem. We weren’t getting our Basecamp activity in Slack in a way that improved our team productivity. We built Field Trip to help Basecamp work with Slack in a high quality package that looks great while staying simple. We’re super happy with our first release and we want to keep making Field Trip better! Did we miss some Basecamp activity that you need in Slack? Would you like to customize what messages Field Trip sends to Slack? We’re continuing to add features to Field trip and your suggestions will help us prioritize what to work on next, so email us at hello@enjoyfieldtrip.com. We can start working on what’s next together!